C.A.V.E. 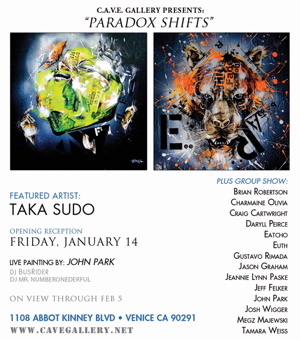 Gallery is pleased to present new works by Vancouver based artist Taka Sudo. After a series of impressive exhibitions in Portland, Vancouver and Japan, Taka has created a bold and exciting collection of mixed media paintings for his debut feature show in Los Angeles. Taka’s dynamic style is influenced by the energy of the overcrowded subways, soaring skyscrapers and warmth of the people of Japan. From Japan, Taka moved to BC Canada where his love for nature and the outdoors has inspired his compelling imagery of resplendent chaos. Taka’s new works in “Paradox Shifts” include a series of fractured images of faces, reflecting the conflicting messages swirling around one’s environment. These scattered forces are composed in a nebulous “balance” of collaged paint and print (creating a state of shifting neutrality) pulling and pushing the viewer through an ebb and flow of visual energy.